If you care about agriculture, you need to know senator Debbie Stabenow. When Congress talks food and farming, Senator Debbie Stabenow (D-Michigan) is there. From 2011 to 2014, she was chair of the Senate Agriculture Committee, and she remains a ranking member with enormous influence over what our nation eats. Stabenow shepherded the latest farm bill, which was signed into law in February 2014, after a long, contentious slog over cuts to the Supplemental Nutrition Assistance Program (SNAP) or “food stamps” and farm subsidies. Big ships turn slow, and the trillion-dollar farm bill is one of the larger legislative vessels. Although the legislation kept farm subsidies in place that will mainly benefit the nation’s largest, most industrialized farms, it also includes more support for local and organic farming than ever before. It also makes mid-sized, diverse operations more stable through whole-farm insurance. 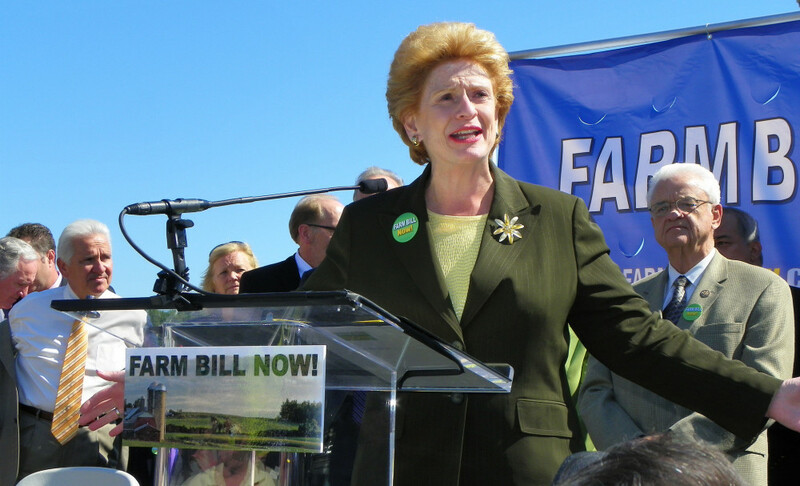 We spoke to Stabenow recently about the farm bill, bird flu, and how people in the food movement can have their voices heard in Congress. The Senate Agriculture Committee is currently debating the reauthorization of child nutrition (i.e., “school lunch”) programs. How is Congress fighting our simultaneous childhood obesity and hunger epidemics? Five years ago, we set the nutrition programs on a path to create more access for healthy food and to tackle childhood hunger [with new, healthier standards]. I think we’re just seeing benefits emerge. And it’s very important that we don’t go back on our commitment in terms of policy and funding. The Harvard School of Health tracked eating habits and found on average children are eating 16 percent more vegetables and 20 percent more fruits in school meals, which is positive. But we still see very high obesity rates. And too many children who only eat at school don’t have access to healthy food in the summer. You said in the recent childhood nutrition hearing that “Nutrition, at its core, is preventative medicine.” Can you expand on that? There’s no question about it. We spend $1.4 billion on preventable health care costs per year for children and apples cost only 14 cents a piece. The truth is good nutrition for children and adults is about preventing diabetes, heart disease, and all kinds of different health challenges. This is also a national security issue. When you have 500 former generals, admirals, and senior military officials raising alarm bells that we don’t have enough men and women fit enough to serve in our armed forces, it adds another dimension to the discussion and a sense of urgency. There have been multiple hearings on SNAP fraud, yet crop insurance keeps making news for high profile cases involving hundreds of thousands, and sometimes millions of dollars in fraud. Why hasn’t there been the same level of scrutiny on crop insurance? That’s a really good point. When I was chair we did a hearing on farm bill error rates and looked at SNAP and crop insurance and conservation programs. And SNAP has one of the lowest error rates of any program in the government. The new farm bill requires for the first time farmers engage in basic conservation practices in exchange for crop insurance subsidies. Considering the problems we face, why not increase the requirements to use fertilizer more carefully to prevent dead zones or reduce greenhouse gases? I am supportive of crop insurance because farmers have skin in the game even though the federal government does pay for part of it. It’s a model that’s better than the old direct payment subsidies because [farmers] don’t just get a check. It was a major victory for us to tie conservation compliance to crop insurance and we had wonderful leadership from the environmental community on it. I should also add this is the first farm bill with more funding in the conservation title than the commodity title—that’s historic. But we’ve got to get through this first step on conservation compliance and let farmers feel comfortable with it, which I believe they will. Then we need to have discussions about what you’ve just brought up. I’m open to those discussions, but first lets get the basics done. As for climate change, we’ve added a new carbon credit pilot program in North Dakota through a farm bill grant. Chevrolet has purchased enough credits to protect a large amount of carbon sequestering prairie. So when you look at this last farm bill, there’s much more of a paradigm shift concerning conservation. A scant 8 percent of Corn Belt farmers believe in human-caused climate change. And yet the sector is very vulnerable to the changes already occurring. What is it going to take to turn the farm community around on the issue? The North Dakota project is an example of creating a financial incentive that will get the attention even of those that do not acknowledge climate change. I’ve worked with farmers for a long time and one reason they embrace conservation is because it’s voluntary, but because it also involves incentives, partnerships, and education. Those things can be successful if we aggressively pursue them. Had the Waxman/Markey climate bill passed, farmers would be getting paid to do things like reduce nitrogen fertilizer. Instead they’re now getting sued for that in Iowa. I know. I could not agree more. Over 32 million chickens have been infected by bird flu. Senator Amy Klobuchar (D- Minnesota) is suggesting that producers impacted by the crisis should have a program similar to crop insurance. Do you agree? I’m certainly open to her ideas. I have not talked to her about it. We do have an indemnity program through USDA and they have stepped in. This is huge. [Thirty two] million egg producing birds have had to be destroyed. One farm [can have up to] five million birds. It’s astounding to think of what’s happened. How has serving on the agriculture committees changed over time? I’ve been involved in agriculture committees ever since I was in the Michigan legislature. The biggest change is the shift in focus away from commodity crops. I authored what is called the Specialty Crop Title in 2008–it was a huge fight to get fruits and vegetables in the farm bill even though half the cash receipts in agriculture come from specialty crops. I thought we’d have to re-litigate that, but instead members wanted to build on it. Another positive change is more members have come to the committee from diverse states who are Democrats and are very interested in expanding local food systems. What we’ve seen on our side of the aisle now is much more support for organic production, more consumer choice, and expanding opportunities for small and urban farms. Can you sketch a picture for us what the next farm bill might look like? How serious will the effort to split food stamps from the farm funding be? First of all, you’re giving me a headache. [Laughs.] It took too long to get the last one done! My goal is to keep the food shift we’ve been talking about going, keep the positive things going forward. We have to keep the connection between SNAP and farmers. That’s critical. That was a huge fight and there was nothing more on my mind during the debate than the 47 million Americans who during the depths of the recession had to rely on SNAP to put food on the table. What more can people in the food movement do to get their voices heard in Congress and see action taken on their core values? Members often don’t realize the face of agriculture and the food movement is changing rapidly in their own state. The more people can show that change and reach out to members, or to get media at home, or shine a light on a local farmers’ market or a farm-to-school program, the easier it is to get support in Congress. We’ve hit the presidential campaign cycle with new candidates jumping in every day. What would you ask candidates? I’d like to know whether they support strong food and ag policy for the country? Do they understand the economic impact of 16 million people working in the agriculture and food industries? What is their commitment to families in need? Is it as important to having a safety net for those struggling to feed their families as it is for farmers? Photos, from top: Senator Stabenow at a “Farm Bill Now” Rally (photo courtesy of the National Milk Producers Federation); Stabenow touring Victory Farms in Hudsonville, Michigan; Stabenow with Lafayette Greens Community Urban Garden’s Gwen Meyer in Detroit (both Courtesy of the Office of U.S. Senator Debbie Stabenow).